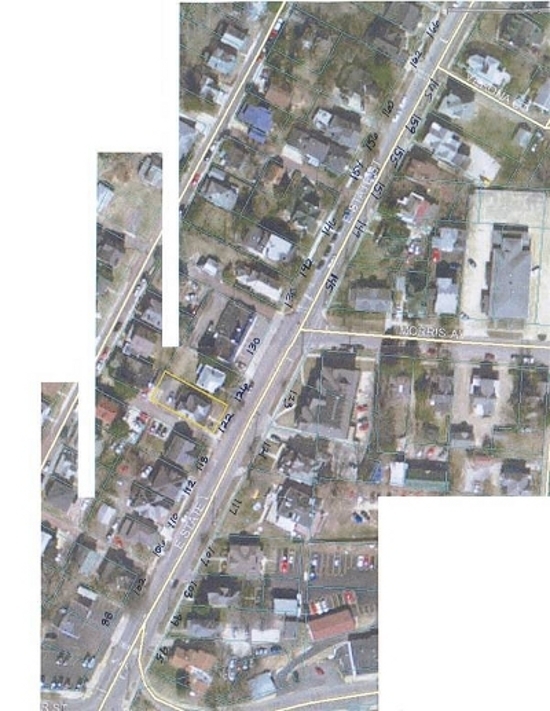 In March 2010 Project Plant launched an effort to enhance the appearance of the East State Street area between the Carpenter/Stimson intersection and Morris Avenue. Project Plant invited all property owners between 96 and 159 East State, and between 102 and 166 East State Street, to a meeting April 14, 2010 at Liz Maule Realty Office, 122 East State Street. 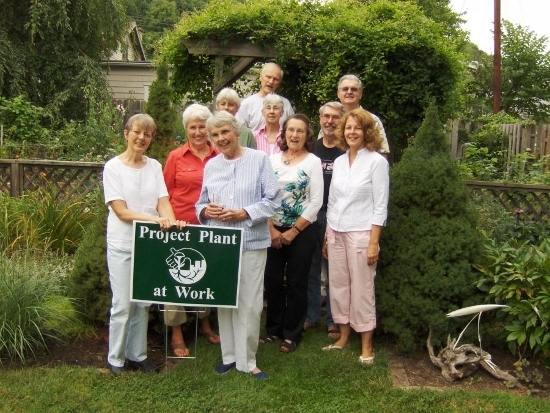 By June 2010, the group set in motion the planting of 14 trees along the street and established a plant sharing network. The trees are in the tree lawn on the east side of the street from Stimson to Morris, and in City rights of way on the west side of the street between Carpenter and Morris. Click here for a list of the trees and their addresses. The 2011 City of Athens Arbor Day celebration, set for Friday, April 29, 1 to 2 p.m., will honor the neighborhood tree planting with an official ceremony at the Theta Chi house, 117 East State Street. Residents of the neighborhood, property owners, and a class of East Elementary School students have been formally invited; the event is open to the public. Liz Maule opened the plant sharing initiative with an offer of daffodil bulbs from her Briarwood property; they were dug and distributed in May by Theta Chi's Chris Poznako and his TC brother Eric, Jane Richter, Sue Boyd, Susan Mitchell, Martha Laufman, Patrick Rose and Alvi McWilliams. Bulbs went to 95, 107, 117 and 142 East State. Tulip bulbs from Project Plant's East State Street traffic island near Bob Evans Restaurant were distributed to property owners at the addresses above plus other rental and commercial property owners. Susan Mitchell coordinates an e-mail network for plant sharing. The group meets once a month in a noon brown bag lunch meeting at the Liz Maule Realty office, 122 East State Street. Please contact Alvi McWilliams, 593-3294, for more information. 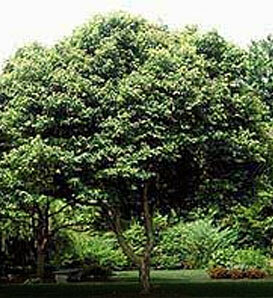 "Small, dapper, handsomely clothed trees are a rarity, and Trident Maple qualifies as one of the best. The habit is oval to rounded." See more. "The pest-free, lustrous dark green, 1½ - to 3½ - inch wide leaves are three lobed (hence, trident). They change to rich yellow and red in fall. Bark on old trunks is quite striking, coloring gray, orange, and brown and developing an exfoliating, platy, scaly character. This species withstands drought and infertile soils and displays excellent cold and heat tolerance. Unlike many maples Acer buergerianum does not develop leaf scorch under drought stress. A fine choice for the small residential landscape, as a street tree, or under utility wires. Grows 25 to 35 feet high, 15 to 25 feet wide. Zones 5 to 8(9). China." Photo from Ohio Dept. of Natural Resources Division of Forestry, Ohio.gov. "To know her is to love her. A wonderful native species that tolerates the worst stresses nature and humanity can impose, yet it is nowhere very common in the landscape. As a young tree, the shape is irregular and the texture is coarse, especially in the winter months. "See more. "The rich bluish green, bipinnate compound leaves, composed of 1½ - to 3-inch long leaflets, soon cover the blemishes of winter, however. With age the habit becomes more uniform, producing a picturesque, obovate crown of rugged branches. Scaly, recurving ridges develop on the gray-brown bark and provide additional seasonal interest. Male and female flowers appear on separate trees. The females produce 3- to 10-inch long, leathery, brownish black pods. The fruitless male trees, such as 'Espresso' and 'Stately Manor' are preferable, and they can be grown from root cuttings or produced through micropropagation (tissue culture). Kentucky Coffeetree tolerates drought, city conditions, and a wide range of soils. Grows 60 to 75 feet high, 40 to 50 feet wide. Zones 4 to 8. New York to Minnesota, south to Tennessee and Oklahoma." "The Sweetbay magnolia, or merely Sweetbay (also Swampbay, Swamp magnolia, Whitebay or Beaver tree), is a member of the magnolia family, Magnoliaceae. It was the first magnolia to be scientifically described, and is the type species of the genus Magnolia; as Magnolia is also the type genus of all flowering plants, this species can be seen to typify all flowering plants. Magnolia virginiana is a deciduous or evergreen tree 10 to 20 feet tall, native to the southeastern United States. "See more.
" Whether it is deciduous or evergreen depends on climate; it is evergreen in areas with milder winters in the south of its range, and is semi-evergreen or deciduous further north. The leaves are alternate, simple (not lobed or pinnate), with entire margins. The bark is smooth and gray, with the inner bark mildly scented, the scent reminiscent of the bay laurel spice. The flowers are creamy white, 2 to 3 inches diameter, with 6 to 15 tepals. The flowers carry a very strong vanilla scent that can be noticed several hundred yards away. The fruit is a fused aggregate of follicles, pinkish-red when mature, with the follicles splitting open to release the seeds. The seeds are black but covered by a thinly fleshy red coat, which is attractive to some fruit-eating birds; these swallow the seeds, digest the red coating, and disperse the seeds in their droppings. Sweetbay is grown as an ornamental tree in gardens. It is often used in horticultural applications to give an architectural feel to landscape designs. They are handsome plant that is not often damaged by ice storms. It is an attractive tree for parks, large gardens, and tree lawns, grown for its large, conspicuous, and scented flowers, for its clean, attractive foliage, and for its fast growth." "A trip through the English countryside will provide sufficient reason for bringing an English Oak into the garden. The three- to seven-lobed, 2- to 5-inch long, rich blue-green leaves hold late in fall but seldom develop good color. English Oak is easier to transplant than White Oak or Bur Oak. "See more. "Tolerates dry, high pH soils. It is quite adaptable and has been successful from North Dakota to Utah to Georgia. The fastigiate cultivars can be used in more restricted planting spaces. Grows 40 to 60 feet high; fastigiated culvitars grow to only 10 to 15 feet wide. Zones 3 to 7. Europe, northern Africa, western Asia. " Photo:USDA-NRCS PLANTS Database / Herman, D.E., et al. 1996. North Dakota tree handbook. USDA NRCS ND State Soil Conservation Committee; NDSU Extension and Western Area Power Administration, Bismarck. 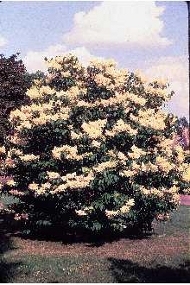 "Japanese Tree Lilac is possibly the most adaptable lilac for difficult sites. It develops into a large shrub or small tree with an oval to rounded crown. "See more.
" The bark is lustrous brown, with horizontal lenticels reminiscent of cherry bark. The dark green, 2- to 5½- inch long leaves develop no appreciable fall color. White flowers are borne in May and June in panicles 6 to 12 inches long and 6 to 10 inches wide; the fragrance is almost privet-like. This species is highly resistant to mildew, scale, and borers. Attractive as a small landscape tree or large bush, it grows to 20 feet high, and 15 to 25 feet wide. Zones 3 to 7. Japan."